Have you ever had a hard time finding medical scrubs in your size? Well, you’re not alone, welcome to the club! With the different scrub styles available; from mock wrap to empire waist scrub tops, it’s tough to figure out what size will look best and be comfortable at work. Uniform Advantage has taken your concerns and launched our brand new sizing chart, complete with measurements that complement the scrub items you’re shopping for! Let’s say you want to buy your self a new scrub top (check out the new Fall Prints, they’re awfully cute! ), try the empire waist since they are flattering to all body types. Are you a medium, large or possibly – dare we say it, a small? We’ve taken the guess work out of the equation! On the product page, just click the size chart logo and find your measurement numbers. It’s as easy as that! 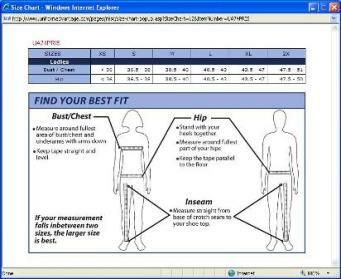 With a bust and hip chart to ensure you’re measuring the correct portions of your body, you can go back to enjoying the online shopping experience! This is not limited to scrub tops either; you also have these fabulous charts to find the right size in scrub pants, regardless of the pant style you’re searching for. In addition to the different scrub styles, we also provide this courtesy for name brand scrubs, including Landau, Peaches and Dickies to name a few. So what are you waiting for? Check out the new Fall Prints Collection or enjoy great savings in the Sale Section. 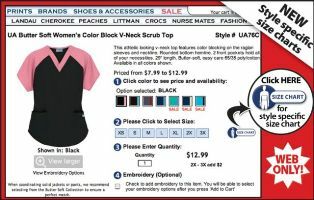 Go online at Uniform Advantageand find the right size in nursing & medical scrubs at the right price, happy shopping!